On November 2nd the 334th landed at Omaha Beach via LCTs, just five months after D-Day D+ 149 to be exact. Mal Hardy, of the 335th noted that their cannon company had watched over and pampered their 105mm howitzer all the way across the Atlantic. He noted the gunnery sergeant nearly fainted when the gun rolled off the transport into 4 feet of salt water. The 84th marched their way inland and climbed aboard duce and a half trucks. 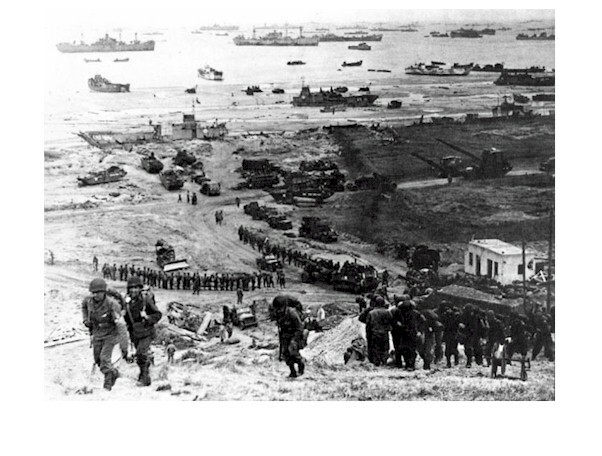 Since D-Day, June 6, 1944, the allied forces had landed in France and battled to breakout of Normandy through August. Through September and October the Allies reached the Siegfried line, the Germans defensive fortifications in the defense of the fatherland. This is where the 84th joined the battle. The Wehrmacht, (German Army) was in a defensive position defending their own soil. On November 5, he wrote he was somewhere in France, surrounded by hedgerows. November 11, somewhere in Holland he noted the anniversary of Armistice Day (seems forgotten). He also noted they could hear the guns in the distance. 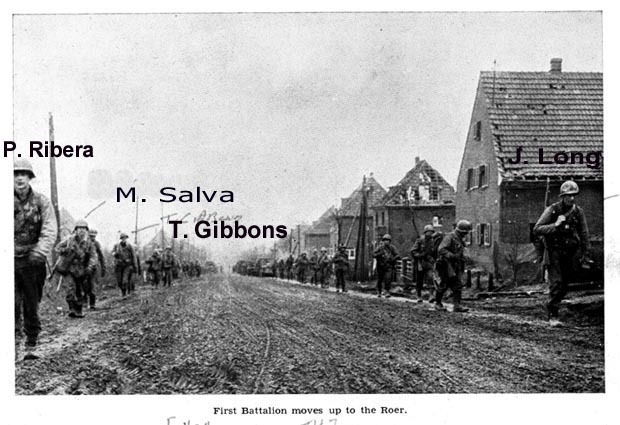 On November 18th the 84th Division went into action. To the north was the British 43rd Division (Wessex) and the Sherwood Rangers Yeomanry, a crack tank outfit. 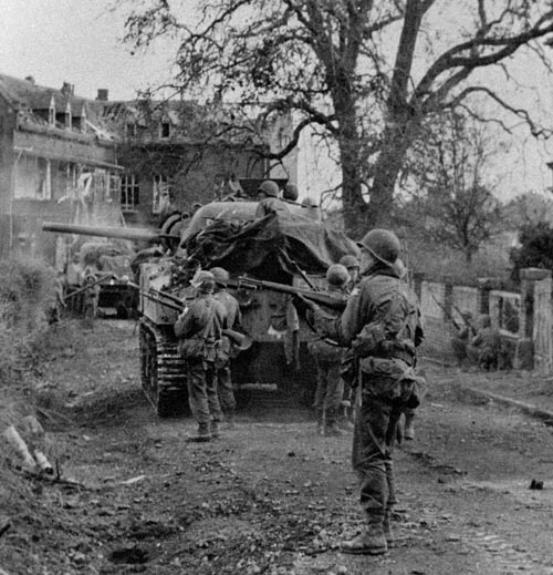 To the south was the U. S. 2nd Armored Division and the 405th Regiment of the 102nd Division. As the Infantry Division advanced on the Geilenkirchen Sector, it wasnt long before casualties mounted. Many Railsplitters were killed, wounded or captured prior to Thanksgiving! Company B was no exception. The typical advancement of the day was preceded by artillery to drive the defenders deep into their trenches then move up the artillery. The rolling barrage was the methodology to advance the artillery fire in progression towards the enemy. As the infantry advanced and fire was returned they would dig in and hold their ground, especially in open ground. On entering villages and small towns care always had to be given to hidden snipers who were left behind. Richard Hussey, who served in a weapons platoon, noted a bazooka worked quite well in blasting church steeples, which often hid snipers. After a hard drive front line combat troops would be given a day off the line. Often new units were rotated in and out of the line at night, as well as adding green replacements. The Germans pounded the infantrymen with 88-mm artillery shells, mortars and dug in tanks. In this area of Germany the Germans knew the terrain and had preconstructed defensive positions. Railsplitters fighting alongside a British tank. The Railsplitters would soon learn the numerous tactics of the Wehrmacht first hand. The Germans had long known of the GIs interest in collecting souvenirs, so often items were rigged to booby traps. It was also commonly repeated that if caught with a German pistol the Germans would shoot you with it. Two machine gunners would establish a line of fire with one gun firing tracers a few feet about the ground. As the infantrymen crawled under the tracer fire the second gun would blast away below. Pillboxes would be abandoned after fixing their position by adjacent artillery. Once the GIs took the pillbox the artillery would score a direct hit. The Railsplitters were up against the 343rd Regiment of the 183rd Volksgrenadier Division, who were supported by the units of the 9th Panzer Division and Panzer Grenadier Companies as well as units of the 10th SS Panzer Division - Frundsberg. It was written in Fortune Favored The Brave that this was the strongest section of the Siegfried Line. 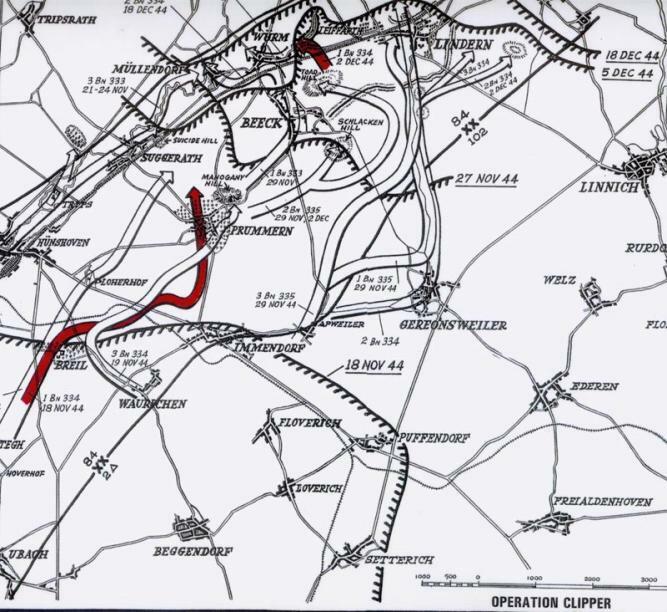 Operation Clipper came up against the strongest part of the strongest line in the world. In no other engagement did the Germans resist as they did our first week in combat, and never again did we have to pay the price per foot that we paid before reaching Beeck. By November 21st, one third of the original infantry soldiers men were gone. It literally rained mortars and 88 rounds on the GIs.
. but it was a great point and shoot gun. Even the weather was against the 84th. Heavy rain had created very muddy conditions, which mired tracked and wheeled vehicles. Further, standing, crawling fighting and sleeping (if you could) in mud and standing water caused trench foot in epidemic proportions. A condition, which would further haunt those unfortunate enough to be captured. Trenchfoot referred to a condition caused by poor circulation in the feet. In November of 1944, all the elements were against the GI, it was cold, it was very wet, combat boots were not waterproof (Where was LL Bean?) and GIs tended to lace their boots too tightly. Trenchfoot was extremely painful and made walking near impossible. At its worst, you would lose toes and/or whole feet. Nov. 18th Attacked Gilenkirchen, (Geilenkirchen) attack successful. On December 1st B Company advanced towards Leiffarth. Heavy enemy fire from machine guns, dug in tanks and mortars held the men at bay. As heavy shelling began the men dug in. The Company held in their foxholes two days. The historic record shows when Company B took Leiffarth it had to dig in and defend it. Heavy enemy fire stranded units in the field and after nightfall German patrols were able to easily round up the stranded Railsplitters. My father had said certain elements of the unit pulled back to safety, but failed to pass the word. Those left were virtually defenseless. The Officers or NCOs gave the order to surrender and about 30 G Is headed for Germany without their weapons. On December 6th the remainder of the Company fell back to Geilenkirchen to regroup and assess their loses. Between November 1st and December 8th, B Company: 17 men KIA, 59 were wounded, and 31 were missing in action. Copyright � 1999-2002 WW-II Heroes. All rights reserved.